The Rafter Double U Ranch Cattle Brand commission measured 16 inches high x 40 inches wide. The brand was inserted into a china cabinet door frame. This was an interesting commission as we combined 2 inch sq bevels and Spectrum # 451-20W Ruby Red Waterglass for the border and brand. For the centre portion we used Spectrum # 100B Clear Barnwood, however it was a tricky layout and cutting of the barnwood glass as we wanted to match it across the brand. The barnwood glass is raised and all of the pattern had to be laid out on the reverse side of the glass where much time was needed to ensure that the glass matched. When one is doing this kind of matching one only has one chance to figure out things and cut the glass accordingly or no more matching and or starting all over on a new sheet of glass. We were most fortunate to have been able to obtain the Spectrum glass our clients wanted before the closing and sale of Spectrum Glass Company last year. To help us with this design we once again enlisted the design help of Martha from Paned Expressions Studios in Edgewood Maryland. The panel had to fit exactly into the reverse side of the cabinet door and the outside was surrounded with Cascade Zinc # ZB 932 which has a width of just over 1/4 inch. The first picture shows the completed design before being inserted into the wooden cabinet frame. 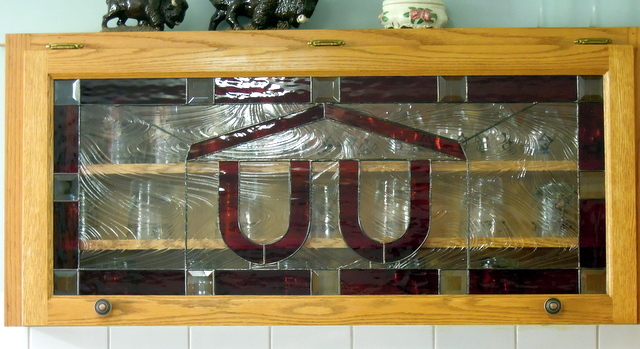 The cabinet frame had a 30 – 40 year old came stained glass panel which our clients did not want. We had to remove it, then clean out the old glue/cement and we found new rubber replacement material to hold in the new brand. Before installing the rubber, we used a clear silicone cement, then carefully hammered in the rubber material into a thin slot in the wooden frame. 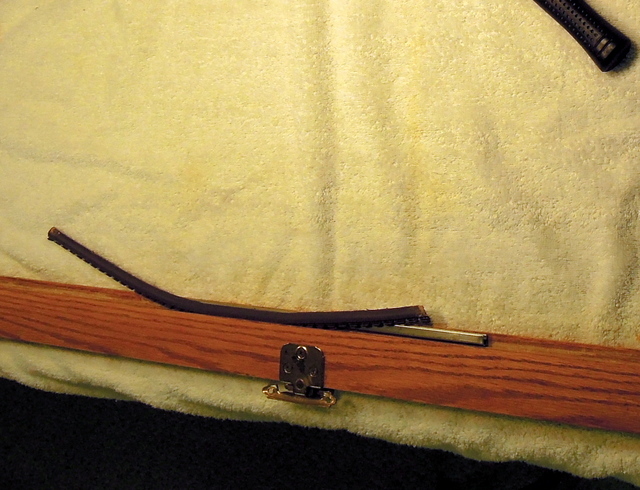 The following picture shows the brand installed into the cabinet door frame. The last photo is the brand and frame all installed in their ranch home. As always, you’ve done a great job! Yes, lots of fun matching that background glass but you did it beautifully! !